David Powers King: Tuesday Tropes: "Let's Split Up!" Tuesday Tropes: "Let's Split Up!" There are multiple tasks that need to be done and not enough time to accomplish them, unless you have an assortment of friends and a plan to rendezvous long before the place blows sky high. I hope? "Let's Split Up!" - When a group separates, by choice or not, which often results in dividing the narrative, usually to accomplish a task or to create "separation anxiety" for them and for the audience. This trope can be used in a variety of ways. The most common is used to cover more ground when characters search for something. Another method is to divide the group when an enemy is after them, forcing the baddie to chase one or the other, just to throw them off or (if more than one baddie) weaken their numbers for an ambush. Maybe some members in the group can't settle their differences and think it's best to part ways before they bash each other's heads in. Sometimes, out of their control, the group is forced to split up, either because a tunnel collapses or a bridge gives, or the continents divide! One of the most effective examples comes from The Lord of the Rings, the original fellowship parting in three ways by the end of the first book. It allowed readers to see more of Middle Earth as the narrative jumped between the three divides of the main group. "Let's Split Up!" is a fun trope and often works when characters don't want to be separated or if the split otherwise makes sense. "A mad slasher's after us ... let's split up!" ... I think not. Have your characters always stayed together, or did they split up? What are your favorite "Let's Split Up!" moments you've seen? I'm David, and we can do more damage this way! My characters tend to stick together. This trope never works in horror films. Ever! Yeah, because when they do, everyone dies. Jinkies! Sometimes I have characters doing different things. 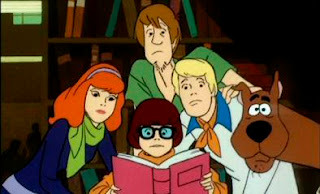 Instead of Scooby-Doo I like to think it's more like Mission Impossible or the A-Team or something where each member of the group has a specific role on the team to play because obviously not everyone has every skill. So maybe it's like those role-playing games then, though I suppose in those you don't generally split up. I really want to watch Scooby Doo now. But seriously, if I were chasing a baddie or exploring a haunted house, I would absolutely put my foot down at splitting up from the group. Just not a good idea. In fact, I'd get on the phone, call 45 of my other friends, and have them come to the haunted house/asylum/abandoned amusement park so that we could explore it all together. I love it when characters split up because each has an assignment, and they're all equally impossible (I'm thinking Return of the Jedi here). It's a great way to keep up the tension, though at the end I usually wonder if things could realistically resolve themselves as well as they did on screen. Oh, you gotta do the "split up" LOL... I've definitely used it---though in my latest work, I haven't gone there! OH boy, Star Trek really used this trope A LOT. Poor red shirts, "You...guy in the red shirt...go and investigate that strange beam thing and report back to us." Great examples here, David. I'm struggling to think of one... hmm. Michael already said Star Trek, which is very true. They split up in like every episode. It was great. My characters split up in the name of trying to be the hero (or heroin). I also like to split up my characters in the name of character development: how they are in a group dynamic vs. how they are with another character, etc. In my second series, my protagonists must split up all the time. Now if only everyone would like my story as much as LOTR. This is very effective in battle sequences, though. In books 5 and 6 of my series, the characters split up to do things more efficiently. Otherwise, I usually have my characters stick together so I can build relationships with them. I usually have my characters split up at some point--I'd never thought about it as a trope before, though. Interesting post! I'm always yelling at the TV, "Don't split up you idiots!" No one ever listens :) I loved (and hated) when Ron left in Deathly Hallows. But it has to be done. Great post David! And your damage is legendary!!! That's a good technique if you write with multiple POV characters. LOTR is a good example. My goodness David, the place looks great! Love it. I kind of used this trope in my last ms. They were split up but not by choice. Okay, maybe it's not the same at all. Hehe, I actually used this one just yesterday...Perfect timing. And another trope I've actually used. I often split up my characters because it weakens them. I'm so mean to my characters hehehe. Hmmm... Nope. I don't think I've ever split my characters up. Something to think about in the future. And I LOVE the new look! Awesome David! Aww, Land Beore Time! I use this trope pretty often - it's a good one. LOTR is a fantastic example. Can I just use that one. I love this concept. I've actually never used it. Will have to place it in the "to use one day" file. Thanks for your ideas, David. Splitting up, classic for horror movies, only leading to death, death , and more death. I'm finally claiming my prize and sending you the query for Birds of a Feather :) Thanks again! When I split my characters it usually ends up being another book. Or three.